The story began back in 1996 when 3 high school friends joined to become what is now known as ‘Gavin’. After 6 years of practise, 100’s of shows, two new members and numerous recordings, Gavin have begun to build themselves a name in Melbourne and the National music scene. Gavin’s success is rooted in the perfect blend of strong melodies, interesting arrangements and an insatiable taste for loud guitar rock. Their clever use of the classic twin guitar sound combined with their captivating live show and 2 great recordings add up to a good package. 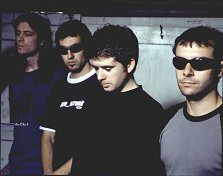 A Tale of Two Cities (2000), and in particular the first track “Orange Slime”, received glowing reviews and radio airplay on both Triple J and public radio stations around the country. “Orange Slime” was included on the “Push, Play, Record” and “Kiss My WAMI” compilation CDs. Gavin's self-titled EP (2002) is a testament to indie guitar rock. A combination of infectious vocal melodies and eclectic guitar licks. A 3 minute pop song never sounded so good. http://www.gav-net.com - Gavin’s web site contains up to date information, MP3s & videos, news, and other things of interest related to the band.